I had never heard of this band before so I wasn’t sure what to expect other than a melodic rock album with a pretty sweet album cover. Upon further inspection, Los Angeles is the brainchild of singer Michele Luppi and producer/bassist Fabrizio Grossi. From what I understand, their debut album relied heavily on covers and outside writers, but a much more personal effort was put forth for Neverland (though a few covers are here). This is an enjoyable melodic rock effort all the way through but there are too many mid-tempo numbers and ballads for my taste. Yeah, I know, melodic rock isn’t exactly the kind of place where you expect speedy songs, but the group set the bar pretty high for themselves by opening the album with the title track. It’s a good rocker featuring some nice guitar work and the rest of the album fails to rise to this level, in my opinion. Michele Luppi is a good vocalist though and I’ve read he’s done some really nice heavy metal work previously. There are times when he sounds bit silly with his pronunciations, but that’s par for the course with many European melodic rock bands that I have heard, so it isn’t a big deal. 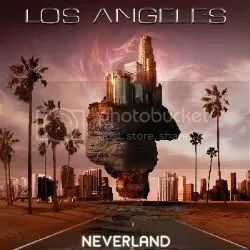 There a few choice tracks here that should please AOR/melodic fans and there’s potential for Los Angeles to “wow” me on the next release, but as for Neverland, it’s “just” a solid effort.